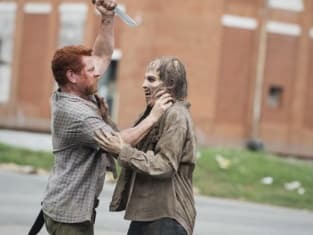 It looks like the plan to go to Washington D.C. might be a bust now that Eugene has confessed his lie to Abraham Ford. And Abraham Ford is a man on the run from his past, which makes his refusal to turn back both an asset and a flaw. What did we think of this week's The Walking Dead? That's what we're here to discuss. Join Eric Nordhoff of the Walker Stalkers and Carissa Pavlica, Sean McKenna, Whitney Evans, and Miranda Wicker from TV Fanatic as we break down "Self Help." Jump into the comments below and let's keep the discussion going! What was your favorite quote or scene from The Walking Dead Season 5 Episode 5? Eric: “I’m Not A Scientist! !” - the scene where Eugene confesses he’s been lying was excellently played by all parties. Carissa: When Abraham said he needed to get a piece and Glenn was like, Uh, a little too much information, but you go guy! The giggle was highly appreciated. Sean: I really loved seeing the massive walker horde. We always get them in small bursts here and there, but there were so many on the horizon! And to think, Abraham thought going through it would be a good idea. Whitney: I really enjoyed the scene in the bus before it crashed. I liked Tara teasing Eugene about his mullet. I had an unfortunate mullet back in the day, but I didn't own it like Eugene does. Miranda: I'm the weirdo who enjoys flashbacks that fill us in on who these characters were before the ZA, so finding out that Abraham brutally killed people to protect his family only to have them run away from him in fear was well done. Were you shocked to learn that Eugene has been lying about the cure? Eric: No. I am a reader of the comics, so I expected it to happen. I told James at the very beginning that I bet Eugene is going to confess he’s lying in this episode. Then, I took it back because I thought it was too early - they weren’t even close to Washington DC yet. So, I was a bit surprised it happened so early in the season. Carissa: Not at all. I never believed he was anything other than a redneck. It became way too obvious during the episode as they kept referring to his hair and rubbing his nose into the fact he in no way resembled a scientist, but what can ya do? Sean: Not really. I kind of hoped that maybe he had at least some key thing related to a cure or something along those lines, but it always felt rather obvious that he was lying. Though, his reveal and the reactions were pretty intense. Whitney: Since I'm not a comic book reader, I didn't really know where this story line was headed but I guess I should have seen it coming. I guess it was kind of naive to think Eugene of all people would be the savior of mankind. It was always a little too good to be true. Scale of 1 to 10, rate the fire hose method of zombie killing. Eric: 8 - Very good method. You are high up so they can’t get you. The power of the water rips them apart. Depends on a supply of water. When that water runs out, you’re screwed. Carissa: I'll give it a 7 for the entertainment value. Practically, it's worthless. There aren't many fire trucks on their route, but as we've learned on Z Nation, adding a little excitement to the zombies' exit adds a lot. Sean: I know this show prides itself in coming up with creative ways to kill zombies, but it seemed like such a waste of water. Weren't they just drinking toilet water? I guess I'd give it a 6 because it was a new way to kill them at least. Whitney: I have to agree with Sean here, my first thought was why is he wasting all that water? They have all proven to be pretty capable zombie killers, so they surely would of had no problem dispatching that group of walkers. Aside from that, I'd give it a 7 because it was entertaining. Miranda: Look, I have to give this a solid 9. Kill the zombies AND wash away the guts all at the same time? GENIUS! Should the group continue on to Washington or go back and find Rick? Eric: Go back and find Rick. That’s what I would do. My feeling is Noah will be found and he will lead them to Richmond, VA.
Carissa: They most definitely should turn back. Even though there is a modicum of thought put into Eugene's theory, the reality is all of the important people in Washington were air lifted to bunkers in remote parts of the US. Washington is probably the equivalent to a bombed out ruin after that. Sean: I want them to go to Washington, but without Eugene knowing how to cure it, etc., what would be the point? At least if they go back to Rick, they've got a larger crew to face off with any opposition. I'd love for them to leave Georgia, that's for sure, but I'm hoping the show finds a way to give them a reason to really push on towards a new place. Whitney: They definitely need to go back and find the others. What exactly is in Washington at this point? Their hearts are with the group and that's where they should be. Miranda: I agree they need to go back and find Rick. There's safety in numbers, and right now, they all need to stick together. If the plan to go to Washington is a bust, they need to find a place to settle down for a bit, rest up, get healed, and come up with a plan. They can't get complacent in their safety like they did at the prison, but they have to be healthy to survive. If they continue on, how do they get past the zombie horde? Eric: I think they can’t go that way with the fire truck. They will have to go on foot around the massive hoard through the woods and come out around, find another car and continue on. Carissa: Either they all cover themselves in Zombie goo and try to pass off as just another roving zombie herd (have they done that in TWD or just Shaun of the Dead? My zombies are all confused) or they go around. Abraham was pretty intent, pre-soon-to-be-mental-break, on going through and not around. My guess is it won't be an issue and they'll turn around. Sean: They'd have to make a detour, going back south or something. Or maybe they could find a convenient helicopter with fuel and fly on over them. It could happen, right? Whitney: That was a pretty big group of walkers, I'm not sure they would really stand a chance. They could go the pretend to be a zombie route, but they're better off just turning around. Miranda: It's risky, but I say create a diversion. Find something flammable, make some Molotov cocktails and launch them to either end of the herd. When the zombies clear a path, make a break for it. Keep running and do not look back. 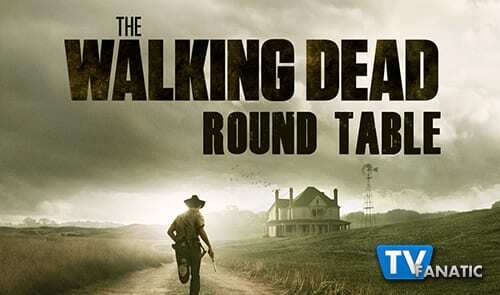 Get your fill of zombies right here at TV Fanatic when you watch The Walking Dead online! 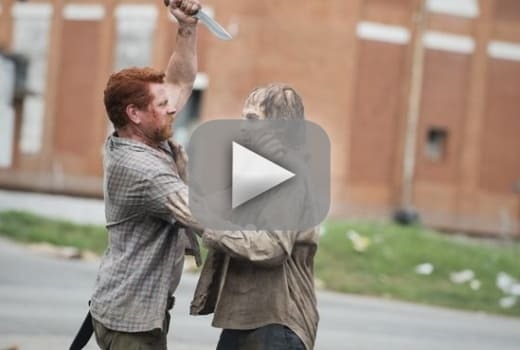 And here's your first look at The Walking Dead Season 5 Episode 6, "Consumed."